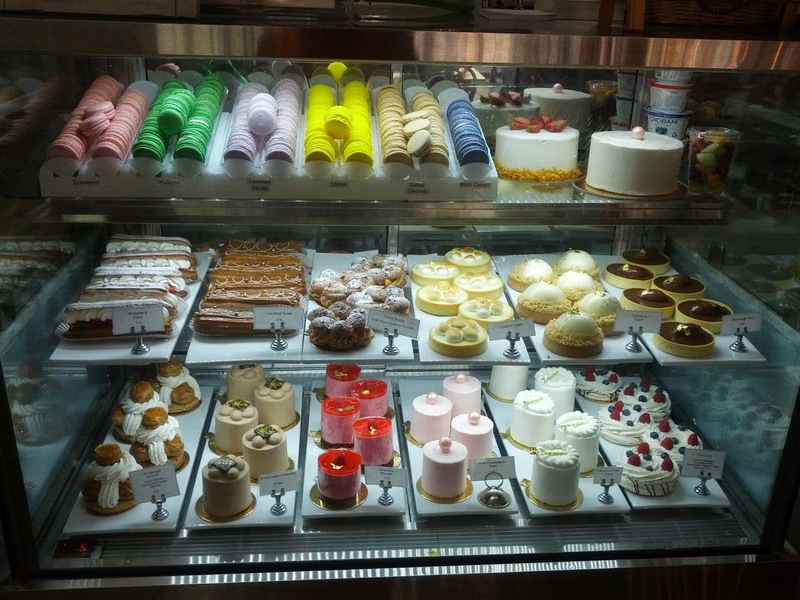 Last Saturday I went to Estelle's Patisserie with one of my friends, Traci. I read about this place in the Sacramento Magazine, and also from other people who said it was a very good place. I love coffee, and as I stated in one of my early postings in this blog: "I always get seduced by Fine European Pastries". This patisserie is very American-French, shabby chic. I can see the appealing of it. It is spacious, with a lot of comfortable sitting, which reminded me of the Health Spas Sunrooms from the early 1900s. Very simple and elegantly decorated. I ordered a cafe latte, a turkey and cheese sandwich to eat in the place, four strawberry macaroons and a lemon tart to go. 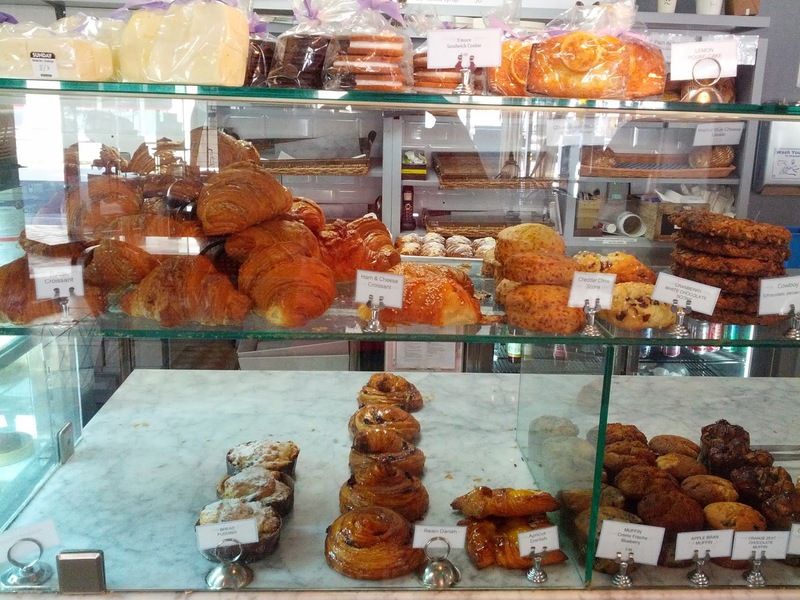 It was very difficult to select one of the pastries, because everything looked delicious. ♥ The Staff was very polite and courteous. ♥ The order is brought to your table. ♥ The cutlery is not plastic. ♥ The coffee cup is porcelain, very European style. ♥ The napkin very thick and elegantly decorated. ♥ The music is not too loud. ♥ There is plenty of seats to choose from. ❀ Parking is challenging. There is one hour and two-hour street parking, and also the Capitol Public Parking a few blocks down the store, walking… between 5 and 10 minutes. 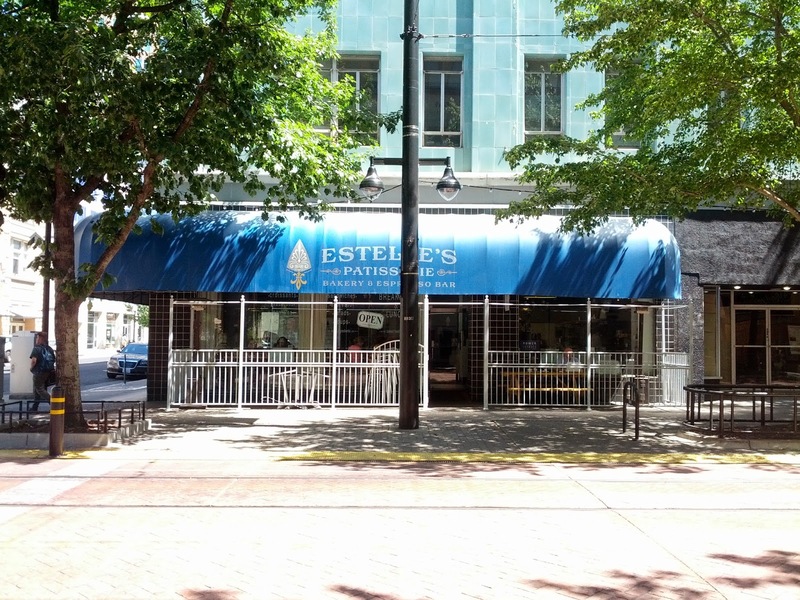 My friend Traci phoned Estelle's, and they admitted that the parking was challenging. We expected it. I didn't use the ladies' room, and/or brought my laptop so I have not comment about them, but I would be very surprise if they don't have clean restrooms and/or free Wi-Fi. Making coffee is an art… the coffee was okay, for being a cafe latte, slightly strong. The sandwich was very tasty. I requested wheat bread, which was spongy and moist, normally with turkey, the sandwich might be dry, but this one was not. I like the look of macaroons, however I am not a huge fun of their taste, too sweet for me. I do think they look very appealing, don't they? The lemon tart was still too sweet for me, but this is not a flaw of the place, it is my taste. European pastries are not as sweet as in the United States. The lemon tart was firm, and it melted in my mouth, in an explosion of acidity from the lemon and sweetness from the sugar. I really enjoyed the crust. The pastry was light, but I would not recommend eating the whole thing in one setting. It has a very respectable size, and sugar overload might happen. I learned this… the hard way. Glutton me!! I personally would recommend this place. I had a really good time with Traci, chatting and eating good food in a very pleasant environment. A little taste of cottage charm in the middle of Sacramento. I will go back for sure.